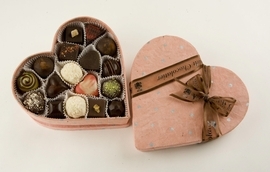 In my household, we don’t stand on romantic ceremony – I pick my own Valentine’s Day chocolates. So I have no one but myself to blame if I don’t get it right. This year, I was too distracted to mail-order something in time. I am usually happy to take a rain check on a holiday – if George Washington can move his birthday around, why can’t I? So I was going to order something later. 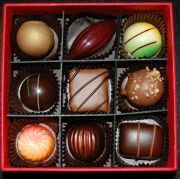 But they had a big display of these Knipschildt chocolates at Whole Foods. I find it very hard to resist their boxes, covered with rough, colorful hand-made paper. I try to remind myself that I don’t eat the paper, but it doesn’t always work. So I ended up with this lovely Valentine’s heart. Unfortunately, while the paper didn’t disappoint me, the chocolates did. They are beautiful to look at as well, but after the intense flavors of my recent experiences with Theo and Chuao, these just didn’t measure up. This time of year, when I think of candy recipes, there is really only one that’s worthy of contemplation: bark. Though I adore a good piece of bark, I rarely find myself consuming it before November and after January. But how many times can you eat the same old peppermint bark? Well, if youâ€™re like me, you can eat it a lot – but that doesnâ€™t mean I donâ€™t want something new! So in honor of this festive candy, here is a bark recipe steeped in Italian culinary tastes for those of you who desire a hiatus from the classic. 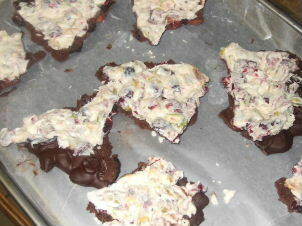 I call this recipe Spumoni Mastiff Bark. Get it? Neapolitan Mastiffs are a type of Italian dog that are known for their daunting size, Neapolitan and Spumoni are both ice cream flavors, and plus, dogs barkâ€¦. Well, maybe the name isnâ€™t that funny/clever, but that doesnâ€™t mean this recipe isnâ€™t tasty! 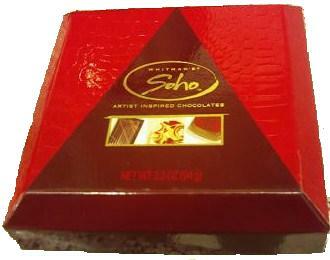 This recipe consists of a dark chocolate cherry almond layer coupled with a white chocolate cranberry pistachio layer. Though it may seem complex, donâ€™t let this discourage you! Bark is one of the easiest candies to make.